Geek Girl Fi created a plush Heart Piece from Ocarina of Time, but with her own original twist on it. The design is ornate, but not very difficult for any craftsperson to recreate. Geek Girl Fi documented the steps she took to create this plush on her blog, as well as made a Youtube video to speak about her experience constructing it. Supplies you’ll need to recreate this: Grey felt, several meters of silver ribbon, small red 3D heart, red ribbon, red sequins, a string of silver beads, and semi transparent mesh. Geek Girl Fi has also created a replica of Majora’s Mask, a Triforce plushie, plushies from Banjo Kazooie, and Mario plushes coming soon. This simple yet elegant craft will make a perfect gift for any Zelda fan this Holiday season, or just be a nice keepsake for whomever makes one. 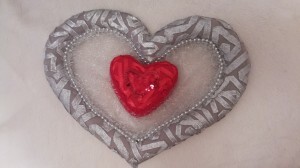 What do you think of this take on a Piece of Heart? Do you think you’ll try to make one of your own? Speak your mind in the comments!